Impulse Pale Rider Condoms contain Extra Lube at the top of the condom and are much Thinner than your average condom. Impulse Pale Rider Condoms are a fantastic feeling for him and her. Unlike any other condom on the market. The Impulse Bare Pleasure condom features 10 rows of ribs at the condoms head, followed by raised studs at the base. This combination will make for a great deep thrusting condom! These condoms are about 6 1/4 Long and are wider than average in width. Trustex Vanilla Flavored Condoms come in a pack of 3 condoms completely safe and approved by the FDA for their strength and protection. The delicious Vanilla flavor and scented lubricant adds spice to your life. The flavored lubricant is completely sugar free. Trustex Chocolate Flavored Condoms come in a pack of 3 condoms completely safe and approved by the FDA for their strength and protection. The delicious Chocolate flavor and scented lubricant adds spice to your life. The flavored lubricant is completely sugar free. 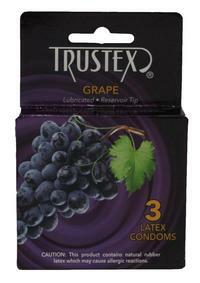 Trustex Grape Flavored Condoms come in a pack of 3 condoms completely safe and approved by the FDA for their strength and protection. The delicious Grape flavor and scented lubricant adds spice to your life. The flavored lubricant is completely sugar free. 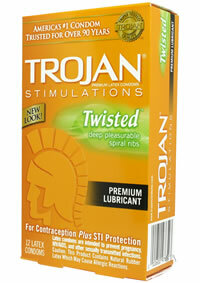 Triple tested Trojan quality. Made from premium quality latex to help reduce the risk. Jelly-type water soluble lubricant for comfort and sensitivity. Special reservoir end for extra safety. Each condom is electronically tested to help ensure reliability. Always insist on Trojan. Trojan Brand Latex Condoms, when used properly, are highly effective against pregnancy although no contraceptive can guarantee 100% effectiveness. This is your basic entry level Lifestyles condom. Its length and width are about average, but with a little extra headroom it has some advantages over straight condoms. Features regular lubricant and reservoir tip. Unique patented ribbed design provides maximum sensation Contains a lubricant for heightened sensation. Reservoir tip for added comfort and safety. Talc-free. Made of the highest quality latex. LifeStyles latex condoms are tested more than 3 times to ensure they meet US standards and provide you with a highly reliable product. The original thin condom - it`s almost like using nothing at all. Made of the highest quality latex, they may be very thin but they are also very strong. 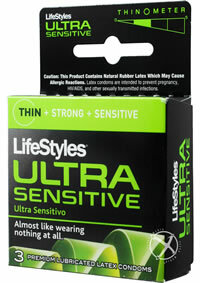 Additionally, these condoms are lubricated for ultra sensitivity and natural feeling. Talc-free and with a reservoir tip for added comfort and safety, LifeStyles latex condoms are tested more than 3 times to ensure they meet US standards and provide you with a highly reliable product. TROJAN MAGNUM LARGER SIZE CONDOMS: 3 PACK are lubricated and have these special features: Larger than standard latex condoms for extra comfort...Tapered at the base for a secure fit...Silky Smooth lubricant for comfort and sensitivity...Special reservoir end for extra safety...Made from premium quality latex...Individually electronically tested to help ensure reliability. Made from premium quality latex to help reduce the risk. Nonoxynol-9 Spermicide is on this condom for extra protection against pregnancy ONLY. NOT for extra protection against AIDS and other STDs. Special reservoir end for extra safety. Each condom is electronically tested to help ensure reliability. Delicately Textured Ribs - Designed for extra sensation. This condom is made From Premium Quality Latex - To help reduce the risk. Condom is lubricated - For comfort and sensitivity. Golden Transparent Color - To add to the sensory experience Special Reservoir End - For extra safety. Each Condom is Electronically Tested - To help ensure reliability. 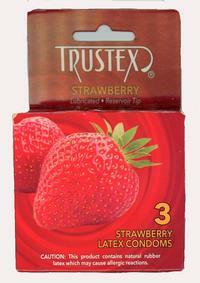 Trustex Condoms 12 pack assorted 12 latex condoms. Assorted flavors: strawberry, vanilla, chocolate, banana, grape, and cola. Reservoir tip and lubricated. The delicious 12 flavors and scented lubricants add spice to you life. The flavored lubricants are completely sugar free. Delicately textured ribs designed for extra sensation. This condom is made from premium quality latex to help reduce the risk. Condom is lubricated for comfort and sensitivity. Golden transparent color to add to the sensory experience special reservoir end for extra safety. Each Condom is electronically tested to help ensure reliability. 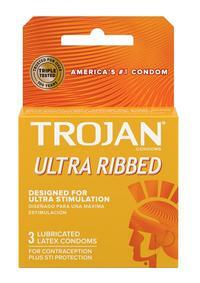 Trojan Her Pleasure Condoms are designed to help provide extra sensation for a woman`s most sensitive area. Made from premium quality latex to help reduce the risk. Special reservoir end for extra safety. Each condom is electronically tested to help ensure reliability. America`s #1 Condom for over 80 Years...New Trojan Her Pleasure Latex Condoms w/ Spermicidal Lubricant are Triple Tested and designed to help provide Extra Sensation for a Woman`s most Sensitive Area! Trojan Twisted Pleasure condoms are designed with a special twist at the closed end, to help stimulate both partners in their most sensitive areas. Unique, patented shape - Designed for maximum mutual pleasure in a condom. Condom made From Premium Quality Latex - To help reduce the risk. Special Reservoir End - For extra safety. Each Condom is Electronically Tested - To help ensure reliability. Say good-bye to that nasty latex taste! These condoms are lubricated in delicious flavors and scents. Colored according to flavor, these condoms are sure to add some spice to your love making! FDA approved condoms. Includes an assortment of: Cola, Strawberry, Vanilla, Grape, Chocolate and Banana.